It would be interesting to see how the three past Observer-Mobitel Schoolboy cricketer in the Sri Lanka squad fares at the ICC Champions Trophy tournament now in progress in England. Dinesh Chandimal (2009), Niroshan Dickwella (2012) and Kusal Mendis (2013), who have come to limelight through the Mega Show in recent times, will add more weight to the Lankan team at the eight-nation tournament. The Observer-Mobitel Schoolboy Cricketer of the Year contest, ever since its inception way back in 1979, has produced many top Sri Lanka cricketers who had made their mark in international cricket. That includes several legendary Sri Lanka cricketers including the world’s highest Test wicket taker Muttiah Muralitharan, World Cup winning captain Arjuna Ranatunga and ICC’s Chief Match Referee Ranjan Madugalle. The first ever recipient of the mega title - former Royal, NCC and Sri Lanka captain RANJAN MADUGALLE says that the Lake House and the Sunday Observer should be complemented for keeping the show going for all these years. 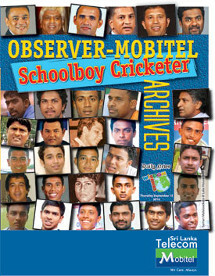 The Observer-Mobitel Schoolboy Cricketer of the Year contest, ever since its inception way back in 1979, has produced many top Sri Lanka cricketers who had made their mark in international cricket. That include several legendary Sri Lanka cricketers including the world’s highest Test wicket taker Muttiah Muralitharan, World Cup winning captain Arjuna Ranatunga and ICC’s Chief Match Referee Ranjan Madugalle. The Observer-Mobitel Schoolboy Cricketer of the Year contest has produced a galaxy of stars in international cricket, including several legendary Sri Lanka cricketers including the world’s highest Test wicket taker Muttiah Muralitharan. Since the beginning of the Observer Schoolboy Cricketer of the Year contest way back in 1979, many of its award winners have made it to the Sri Lanka national team, beginning with Ranjan Madugalle and Arjuna Ranatunga. The latest in the ever-growing list are three past winners of the Observer-Mobitel Schoolboy Cricketer of the Year main title who have been included in the 15-member Sri Lanka squad for the ICC Champions trophy tournament which begins in England on June 1. Former Sri Lanka captain and ex-Sri Lanka national coach Marvan Atapattu said that he considers the Observer Schoolboy Cricketer of the Year title he won in 1990 as a ‘certification or a guarantee’ that he would play for Sri Lanka.“When I had been performing well and scoring constantly for Ananda as a schoolboy cricketer, many considered me as a future Sri Lanka prospect. Although I too had felt that I had a chance, there was no guarantee,” he said. Some of the top international cricketers produced by Sri Lanka, all top award winners of yesteryear, have commended the role played by the Observer-Mobitel Schoolboy Cricketer of the Year contest to promote school cricket during the past four decades.